An ambitious staging of the Easter story featuring a cast of 50 will bring the Gospel accounts vividly to life in Hamilton over the bank holiday weekend. 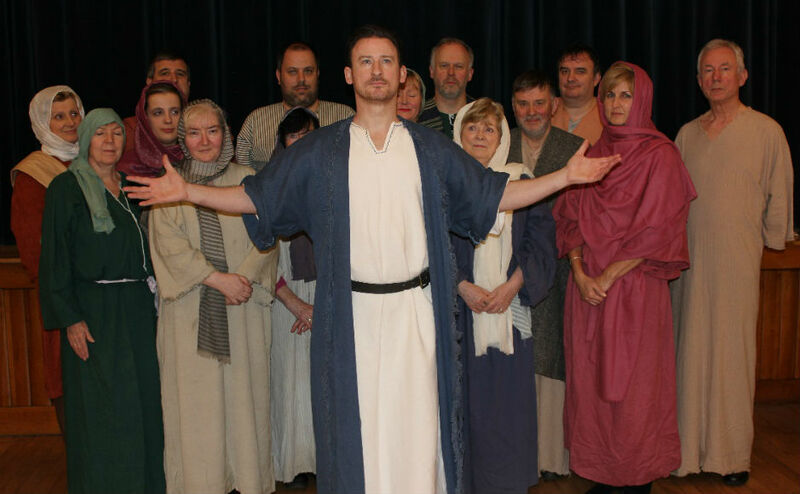 Local people aged from 4 to 81 will play key parts in the performance of the Lanarkshire Passion Play. The lead role of Jesus will be played by Glasgow-born professional actor Nicholas Elliott. The production, an ecumenical initiative led by Hamilton Old Parish Church, will turn the town centre into Jerusalem for the day. Director Liz Blackman, who also comes from a background in theatre, explained why she felt this was an effective way to teach people about Easter. "People will pick up a computer now before anything else," she said. "We want to see things in action. "This provides an opportunity to get the Gospel Message out in a vibrant and creative way." She cites the example of the famous Passion Play of Oberammergau in Bavaria, which has been performed for 400 years, as an inspiration. "We would like it to become a tradition of the town," she said. "Local businesses have got involved: a balcony at the back of Asda will be Pilate's house; Frankie & Benny's Temple Court; Jesus's tomb entrance is in a local lounge bar," she added. The Hamilton branch of Subway also plans to contribute to the production. Mrs Blackman's husband, Rev Ross Blackman, minister at Hamilton Old Parish Church, is equally enthusiastic about working with the community. "The community have really responded well and we hope to bring people into the town," he said. Mr Elliott, who trained at the renowned Royal Academy of Dramatic Art in London, auditioned for the role of a lifetime despite having decided to take a break from acting after the loss of his mother. "I'd been out of acting for 8-9 months but my agent talked me round into thinking about auditions again," he said. "This was the first thing that came up - I jumped at it." "I always had a strong faith in the teachings of Jesus, such as treating others considerately. "When you lose a loved one you start to question things," he said, adding that his mother had always had a strong faith. "I thought: what if my mother could see this." Asked about the responsibility of the role, he acknowledged that each person has an idea in their mind of what Jesus would be like. "You have to make it your own - I felt drawn to it," he said. "The magnitude of how people look at you when we're rehearsing - it's been quite strange but uplifting at the same time." Mr Elliott, whose work on the stage, in TV and on film has taken him around the world, said this is the first time he has acted with a community group in such a large production. The role is immersive and will finish with Mr Elliott on a real cross in the centre of the town, an experience which in rehearsals has made him feel "very emotional". Last year's smaller scale play felt so real, Mrs Blackman said, that "people were touching the robes of the actor playing Jesus". "There is something about it that takes you to a different place," she said. Above all the production aims to give more of a human perspective than seen in many other stylised Passion Plays. 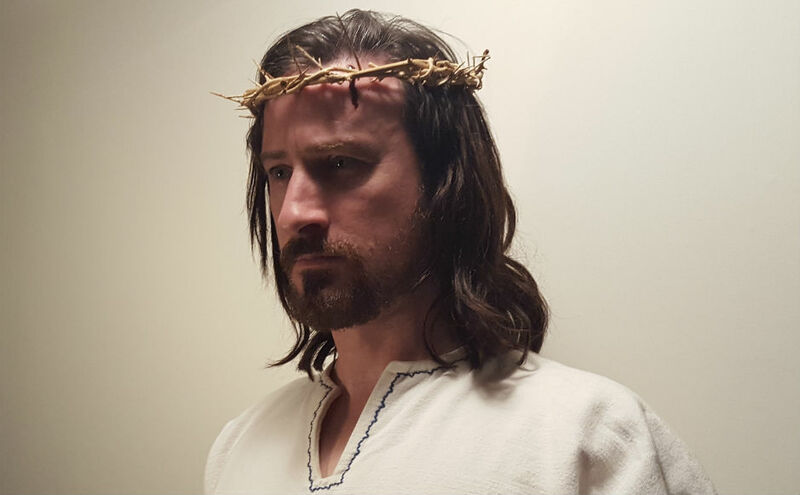 "This production makes Jesus relatable and believable", Mr Elliott said. "When he starts to suffer you should feel like you're seeing a man being tortured, not a divine spirit. "The resurrection is then the pay-off. "It depicts something which has shaped the way many people live their lives." 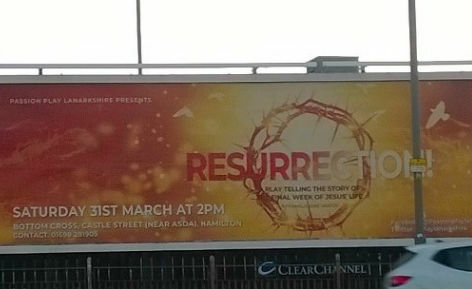 The Lanarkshire Passion Play will take place at the Bottom Cross, near Asda in Hamilton, on Saturday 31st March at 2pm. Services will be held every evening of Holy Week at Cadzow Parish Church starting on Monday 26 March at 7.30pm.